My wheels were sitting in the shade of a tree at the Fair. The painted roving was lying there in the basket waiting for me to finish my coffee. I sat down to get busy. Picking up the five-yard length, I broke it into one-yard lengths and started stripping it down into smaller diameter pieces. A lady standing there watching suddenly said, "I was told it was cheating to do it that way. You are supposed to spin from the end of the whole thing". Well, maybe some people do, but it doesn't necessarily need to be done that way. It is much easier to break down the pretty colors into pencil sized roving strips then pre-draft a little to loosen up the fibers. There is a mystery and magic about how to get the fibers ready for spinning. Roving comes in large balls most of the time in pure white. Here, the roving has been painted and dried, broken up into eight-ounce pieces and put into packages to be sold. Painted roving can have from two to five or more colors blended in them. In order to keep the colorways intact in the spinning, the spinner must strip the roving down into pencil size pieces or break it apart in handier sections then down to pencil size roving sections. It is very difficult to maintain control of singles diameter or the colorways if spinning from the tip of compacted roving an inch in diameter. Take the length of roving and pull it in half down the whole length of the piece. Pull each of these in half again and again until you have a strip about the size of a pencil. Now draft these out a little until the fibers are all airy and the length is about doubled. This is called pre-drafting. Wrap this around your hand keeping the tail of the roving under your thumb so it can be pulled out of the little spiral easily. 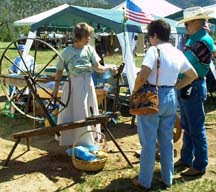 This prepares the length of roving for the long draw spinning demanded of a walking wheel or the regular shorter draw of the treadle wheel. You could, of course, pre-draft all the roving so it moves easily to spin, but this would not preserve the dye artist’s colorways. It is just much nicer to not fight with the bulk of a compressed roving when trying to make nice singles. It is absolutely easier to deal with roving prepared this way when just learning to spin.